Barbara Novak's vivid description of the artists using the train as "a moving platform from which to inspect the landscape" aptly describes Hugh Bolton Jones's sketching excursions during the summer of 1873. He travelled by rail through Maryland and Virginia using both the Baltimore and Ohio Railroad and the Western Maryland Railroad to explore the landscape and collect material for paintings. Jones would have been aware that the value of such landscapes had been enhanced by the publication the previous year of the first volume of William Cullen Bryant's Picturesque America, which included several illustrated essays on Virginia and the Blue Ridge Mountain scenery. The paintings from his excursions exhibited in Baltimore at the Charity Art Exhibition the following year received favourable reviews, but it was Summer in the Blue Ridge at the forty-ninth Annual Exhibition of the National Academy of Design in New York that established the young artist's reputation. The exhibition was considered one of the finest held by the academy, and the New York Evening Post extolled Jones' painting as "One of the most brilliant works by the new men or rising artists [...] which in the freshness and beauty of its treatment can hardly be excelled." More importantly, the painting was singled out by the powerful critic, Clarence Cook, writing for the New York Daily Tribune. Cook was obviously not familiar with Jones's work, although the artist had been showing in the academy's exhibitions since 1867. "Summer in the Blue Ridge, by Mr. H. Bolton Jones, " he wrote, "is a pleasant picture, agreeably composed, showing the fruits of study, and with natural feeling. If, as we learn, Mr. Jones is a young artist, we must hear more of him hereafter; this is most creditable, if it be an early work." Only in the review of the New York Times is there a hint of censure regarding Jones's painting. It reported that while Summer in the Blue Ridge gave a very faithful representation of the area with the foliage rendered with remarkable care and crispness, the colour pure and truthful, "there scarcely seems to be sufficient atmosphere in the picture. The distinction between foreground and middle distance has not been sufficiently observed." It is apparent that is was the painter's more progressive tendencies, the breadth of his landscape with its affinities to the Barbizon painters (whose work Jones could have seen on his 1870 trip to Europe), that attracted the critics to his work. 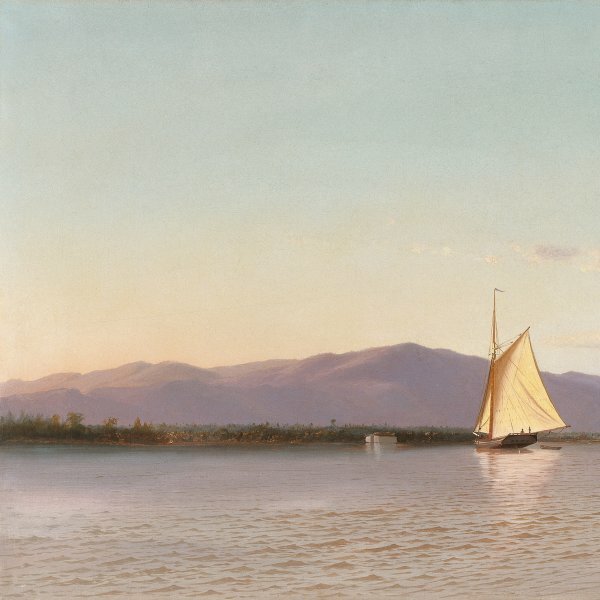 Those elements in Jones' painting which reflected earlier American landscapes -he was later criticised for his "interest in all the minutiae of nature which characterised the old Hudson River School"- are the qualities which the reviewers found objectionable. Two years later Jones would travel to France with his brother, settling for a time at Pont-Aven, where his bonds with French painting would grow stronger. 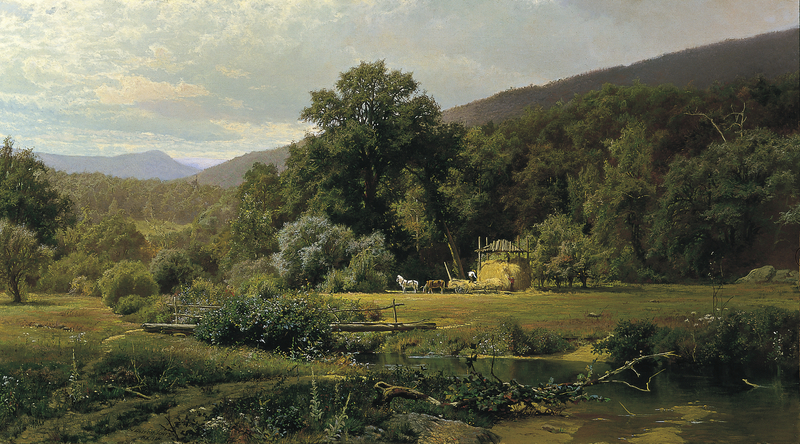 Jones's rural landscape no longer carries the nationalistic feelings of the harvest, often equated with the millennium, found in the mid-century Hudson River landscapes of Frederic E. Church and Jasper F. Cropsey. His canvas retains the panoramic format of the Hudson River painters, but the figures are larger and assume a different significance. The farmer is a simple labourer, not an emblem of the American yeoman, as Jones is concerned with the activities of the harvesters, rather than their symbolic importance within his pastoral countryside.